Ready your popcorn, boys! It's gonna be a wild West playoffs! The first-round matchups are set for both Eastern and Western Conferences, but before we proceed, join us in a moment of silence for the things we will sorely miss this post-season. From the West: Everything about Russell Westbrook (his ongoing beef with the rim, the media, conventional fashion); Andrew “Maple Jordan” Wiggins trying to start World War III between Canada and whatever the nationality of the hapless guy he dunks on; the terrific towers—Sacramento’s Boogie Cousins, Utah's Rudy Gobert, Denver’s Jusuf Nurkic, and Phoenix’s Alex Len; and, finally, the Black Mamba. See you in October. 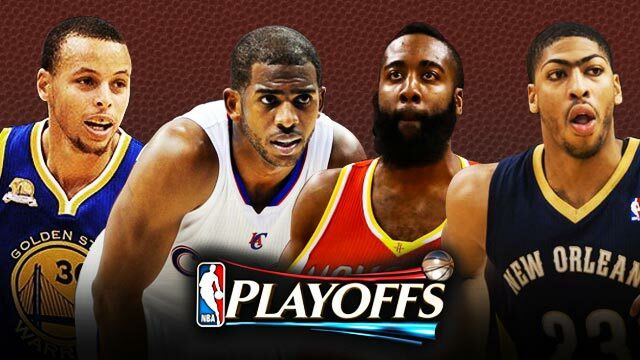 Let’s begin, starting from the least watchable out of the Western Conference contenders. The stats that count: …this is a battle-tested team built for the grinding pace of the post-season, and they make a living inside the paint—leading the league in average makes (22.5) and attempts (41.8) inside nine feet from the basket. Meanwhile, Portland chucks the second most threes per game (20.5) and is 3rd-best in threes made (7.6), but they will sorely miss Matthews—who before he tore his left Achilles last March 6, averaged 2.9 triples a game. When your top sniper is out, the Blazers don’t present that big a threat for Gasol and Zach Randolph to leave the paint open for Damian Lillard and LaMarcus Aldridge to do damage. Watchability: Stylistically, this is the equivalent of a boxing match between an in-fighter like Joe Frazier (RIP), who pounds your insides to jelly, and an out-boxer like Muhammad Ali, who breaks down opponents from a distance. Not saying this will be a classic ala Thrilla in Manila, but what we’re trying to say is this will be a sluggish series. If you like underdogs… Memphis has the better standing and homecourt advantage, even if Portland is the higher seed. Memphis also has the 6th and 5th best record at home and on the road, respectively. All you underdog lovers should stand with Portland, and prepare to have your hearts broken. Chance of an upset: Well, technically speaking, the Griz are the lower seed so their chance of moving to Round 2 is as chubby as Marc Gasol was in high school. Not that it matters but: The two champions of basketball analytics battled for a 3-1 regular season series, in favor of James Harden and whoever healthy bodies they had on the floor. In fact, the Rockets will sport a starting squad that has only played together for 85 long minutes. The Mavs, on the other hand, are still rediscovering their once league-leading offense that stumbled to bottom half efficiency even after they added Rajon Rondo four months ago. The stats that count: This here’s a Texas shootout. If you like high-scoring games, tune in. The Rockets are 6th in points per game (103.9) and 12th in offensive rating (104.2 points per 100 possessions). The Mavs, 3rd (105.2) and 5th (107.2 per 100 possessions), respectively. The more telling stat here, though, concerns two players: Harden and Rondo—both have Playoff reputations on opposing ends. Since 2012, Harden has never won a Playoff series, and has shot below 40 percent (his regular season clip is at 44.5). Dallas also has his number, as his 27.4 scoring average dips to 24.8 against the Mavs. Playoff Rondo, meanwhile, is why Mark Cuban brought him to Dallas. Rondo tends to take his game to elite levels in the postseason. But this was last seen in 2011. Watchability: Like a beauty pageant, the series will offer plenty of eye-candy highlights, with Harden especially. Then again, you’ll also see plenty of posing. The Rockets will kill your mood softly with free throws—lots of them. They’re second in the league with 26 free throw attempts per game. Harden shoots 10.2 freebies a game, making 86 percent. Dwight Howard is also a frequent customer. If you like underdogs…you’ll love this series, especially if you’re a Laker fan who’d love to see Howard hold back tears again after another first round exit. Not that it matters but: The Pelicans avoided a regular season sweep with their lone win against the Warriors a few days ago. Hard to say if they can also do that in the postseason, as coach Steve Kerr’s unit just trashed the rest of the league to accomplish the 6th best winning clip in NBA history, as well as a plus 10.1 average point differential. Why do those numbers matter? Because, historically, the previous seven teams who’ve displayed such dominance have mowed past the opposition, and only one didn’t get to the Finals. The stats that count: This is supposed to be Pelicans’ star Anthony Davis' breakout party. He had a league-leading player efficiency rating at 30.89, and carried on his freakishly wide shoulders a Pelicans team that was riddled with injuries. This party, though, is about to get gatecrashed rudely by the Dubs. You know they can score (second in offensive rating by 0.1 point per 100 possessions), but you’d be surprised to know they also own the NBA’s best defensive rating (98.2 points per 100 possessions). Draymond Green, frontrunner for Defensive Player of the Year award, and Andrew Bogut anchor the defense. Talented as New Orleans may be, they’ll have a hard time scoring against a team as deep and as great as the Warriors. If you like underdogs…your choice is clear. Go Pels? Pellies? Pelics?! Your team’s endgame is clearer. Not that it matters but: The team you love to hate, the whiny, constantly-bitchin’-to-the-refs Clippers, finished the season winning 15 of their last 16 games. As a reward, if you can call it that, they get the defending champs, winners of 14 of their final 16. They also split their regular season matches that, save for one game, were decided by seven points or less. Both teams and their stars are peaking just in time for the Playoffs—particularly LA’s Chris Paul and Spurs’ Kawhi Leonard. This has all the makings of an epic. The stats that count: The key concern for the Spurs is their defense, with starting center Tiago Splitter unlikely to play. Their 3rd-best defense, both in points allowed and defensive rating, falter without Splitter. The Clips have the top offensive rating in the league, and they have interior forces like Blake Griffin and DeAndre Jordan looking to capitalize on the Spurs’ lack of rim protection with Splitter out. If the defensive monster that is Leonard manages to contain Paul, though, it could level the playing field. Watchability: Nothing less than the Pacquiao-Mayweather mega-fight. Two of the best, advancing in age, clashing at the right time. If you like underdogs… The Spurs have never won back-to-back titles; they have to win one game on the road each series to do that; it’s a hard and perilous task. It’s equally difficult not to root for Spuran Spuran! Chance of an upset: The last time a defending champ entered the Playoffs as a 6th seed was in 1995, with the Hakeen Olajuwon-led Houston Rockets. You know what happened to that team (or if you're NBA history is spotty, they repeated as champs). CLICK HERE FOR THE EASTERN CONFERENCE MATCHUPS!